Until the mid-1980s, job security was the top priority of most employees, regardless of industry. But times have changed. 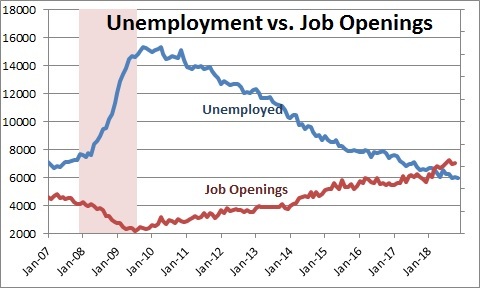 As of the middle of 2018 there are now more job openings than there are unemployed to fill them. Based on Labor Department statistics through October of 2018, there is currently 0.8 unemployed works for every job available. Prior to the recession that number was 1.7, and peaked at 6.6 at the end of the recession (July 2009). With that in mind, it is critical to understand your current crop of workers has a completely different perspective. The threat of job loss doesn't motivate them to work hard. If they lose this job, they'll just go pick up another one. What's it matter to them whether you fire them or they quit? In the end, it's the same outcome. You must come up with a different strategy for building a highly motivated group of employees. Most employees will accept slightly below-market pay to stay in a job they love. Most employees will keep working for an unpleasant boss only if they receive above market pay to make up for the aggravation. 70% of people who change jobs do so to get away from their immediate supervisor, regardless of pay. It’s not just about money, 42% of employees say learning and development is the most important benefit when deciding where to work followed by health insurance. Lack of fair pay, as perceived by the employee, kills employee work ethic. This is magnified with lack of employee recognition and praise. Your highest paid employees will often be the ones most dissatisfied with their pay. Most employees expect their pay to fluctuate with company success; win/win and lose/lose. Bonus plans can drive supreme effort and superior results. Threat of job loss does not motivate employees to perform up to their potential. Offering career training and development would keep 86% of millennials from leaving their current position. Leadership matters, 58% of workers say they’d start a job with a lower salary if that meant working for a great boss. In construction, the attitude has long been "I don't need to pay a bonus; they are already paid to work hard." Or “they don’t need extra benefits, they work hard and in exchange they get a paycheck”. During the last 15 years, that attitude has put you at odds with the available supply of potential workers. The motivation game has changed dramatically, and you must change with it. Millennials and Generation Z have grown up accustomed to instant gratification. They expect an immediate financial payoff for their hard work, and they are easily demotivated. You need a compensation system that accommodates their unique needs and incorporates features that are well aligned to the realities of money's effect on employee motivation. There is plenty to be said around compensation, bonuses, benefits, profit sharing, and alternative pay systems. Over the next several weeks, we’ll dive deeper into this topic and share best practices around building out pay systems that work best for your company and how to build a culture that increases employee retention and motivation. In order to be trulymotivational, your compensation system mustinclude an incentiveplan with these five characteristics: Fair, Understandable, Guaranteed, and Significant. Learn more to ensure your incentive plans are having the impact you want. Would you be willing to spend $20,000 to get $80,000 back, and you get to hold onto your $20,000 until you receive your $80,000, and if the $80,000 doesn't come through, you owe nothing? That's how a profit-sharing plan works.